The Canadian leader of a Jesuit support program for refugees and displaced people in Jordan wants Ottawa to stop demanding the designation “refugee” on official UN documents. The problem, Woods told Convivium, is that the United Nations High Commission for Refugees in Jordan is no longer issuing official refugee status to all refugees. As a result, most applicants get a document identifying them as asylum seekers, not refugees. 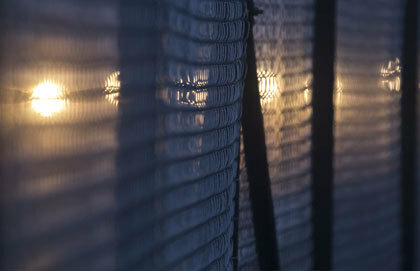 In particular, this holds back asylum seekers who are not Syrian and therefore are not prioritized as refugees. The Catch-22 is that many governments outside Jordan do not resettle those who lack official refugee designation. “As Canada (already) reviews cases on a case by case basis anyway to make sure its criteria are met, those without official refugee status should also be allowed to access resettlement,” Woods says. The Jordanian government has seen its resources stretched to the limit because of an estimated 1.4 million refugees and unregistered migrants who have fled to the Arab kingdom since the Syrian civil war erupted in 2011. Researchers Dina Baslan and Izza Leghtas, writing last October in the independent journal Refugees Deeply, depict Jordan as “refuge” where poverty is crushing and racism towards newcomers is rampant. One result, they write, is a “two-tiered” refugee system that favours Syrians over tens of thousands from countries such as Iraq, Yemen, Sudan, South Sudan, Eritrea and Somalia. After several home visits and face-to-face discussions, they referred them to a lawyer who, working pro bono, compiled a case for re-settling them in Canada through the government refugee resettlement program. 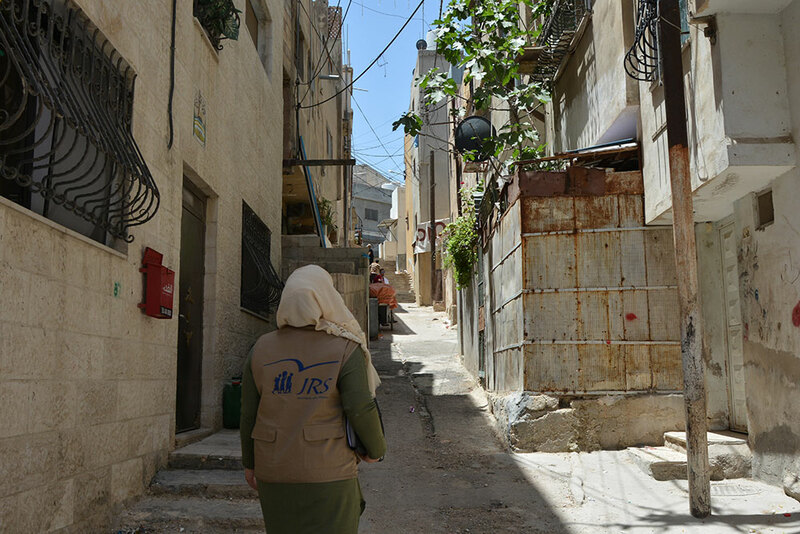 A JRS home visits team member in Amman, Jordan, on her way to visit refugees to listen to them and assess their needs. Photo by Isabelle Shively. Woods confirms the assessment based on her years working with her Urban Refugee Support team. She witnessed the effects of this unequal situation vividly in the summer of 2016 when the refugee support team helped a family of seven that included three disabled children. Without even the finances to buy wheelchairs, the mother, father and five kids faced a life of grinding poverty with little hope for the future. “The parents were forced to carry the disabled kids up and down the stairs to their living quarters and to the office of the UNHCR where they had to go from time to time,” she says. But Woods and her team —with their network of contacts and years of providing support for such families — managed to change the family’s situation. 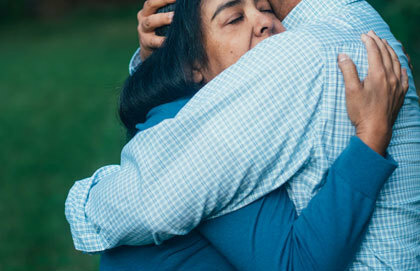 After several home visits and face-to-face discussions, they referred them to a lawyer who, working pro bono, compiled a case for re-settling them in Canada through the government refugee resettlement program. Nearly three years later, the family has settled into a new life in Canada, with wheelchairs for their disabled children, and the support they need to set them all on the path to a bright future. Woods’ own path to working for Jesuits among refugees in Jordan is a remarkable one. Getting from her idyllic, rural birthplace on Salt Spring Island in British Columbia to Jordan’s teeming capital began with her passion for languages and music. It also involved a stop at a 15th century castle in East Sussex in England. The daughter of two Queen’s University graduates who pursued their academic careers in Sharjah, in the United Arab Emirates, Woods spent the years from 2001 to 2005 in the Middle East. There, she developed a global world view as well as a love for both Middle Eastern culture and music. A meeting of the Urban Support Services team of JRS, led by Canadian Elizabeth Woods. Photo by: Franz Diaa. This led her to enroll in an undergraduate program in French and music at Queen’s, where she focused on Middle Eastern music. She spent her first year at the Bader Centre for International Studies, housed at Herstmonceux Castle and Estate, an overseas campus of Queen’s located in Hailsham, East Sussex about 75 kilometres from London. Her Queen’s degree was followed by a Master’s in Near and Middle Eastern Studies at the University of London’s School of African and Oriental Studies. Woods also acquired a certificate in teaching English as a Foreign Language from the University of Toronto. With her hands-on experience and close-up view from the ground, Canada’s refugee policy makers would do well to listen closely to Woods’ advice. 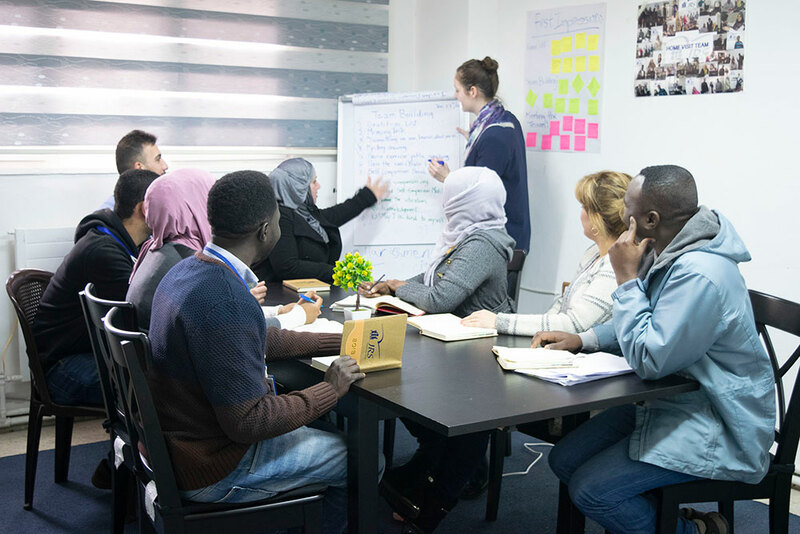 An internship in Amman with the United Nations Relief and Works agency, where she worked with Palestinian refugees, ignited her passion for humanitarian aid. This led to her present position with Jesuit Refugee Service, which was founded in 1980 in response to the South East Asian refugee crisis. From a few camps serving the needs of South East Asians fleeing their ravaged lands in the aftermath of the Vietnam War, the Jesuit Refugee Service has expanded into an international organization. It is now in 52 countries supporting individuals and families through circumstances of hardship that are unimaginable to those living in peaceful and politically stable lands. She tries to include music to build a sense of espirit de corps in the team she leads, which consists of six volunteers drawn from the communities they serve, and three Jordanian staff. “Most of the refugee camps in Jordan are outside the urban centres and 83 per cent live outside of these camps. Any kind of official assistance is mostly restricted to Syrians,” Woods says, a situation which leaves refugees from other war-devastated countries particularly vulnerable and in need of the most basic necessities of life. This is where Jesuit Refugee Service has a uniquely humanitarian role to play. In the spirit of accompanying displaced people on their journey, it offers personalized services and visits with follow-ups to refugee families. She is responsible for all program management including liaising with other NGOs such as the Centre for Victims of Torture, Caritas, Save the Children and the UNHCR. She also interacts with individual and group donors such as parishes in Italy, where JRS has its head office, and other countries.